In 2007, three artists joined the conservative Slovenian Democratic Party (SDS) and officially changed their names to Janez Janša, the then Prime Minister of Slovenia (see: 1:1 scale). Shortly after this event, on August 11, 2007, Janez Janša and his fiancé Marcela Okretič were married. Janez Janša was the best man of the bride and Janez Janša the best man of the groom. The invited guests – the friends and family of the artists – were unaware of the name change, learning of it during the ceremony directly from Branko Franc Grošl, the marriage registrar at the municipality of Ljubljana. 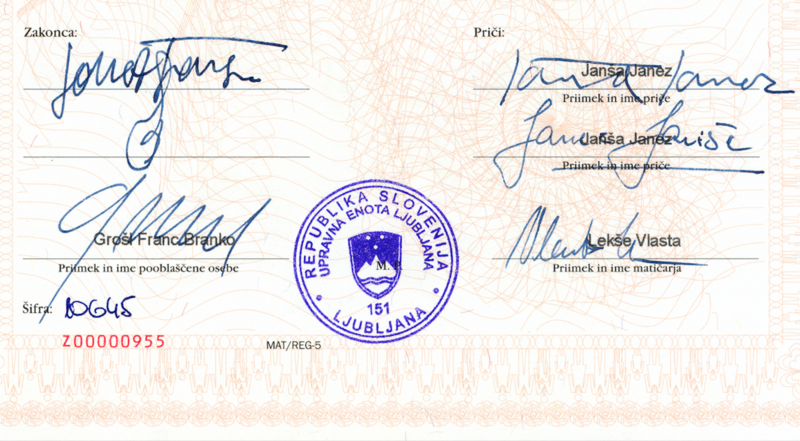 The Marriage Certificate represents the first time the names and signatures of the artists Janez Janša, Janez Janša, and Janez Janša appear together on a single document (see: coefficient of art). The report presented in exhibition consists of a copy of the artistic work and marriage certificate licensed by the Museum of Modern Art in Warsaw for the duration of exhibition. Courtesy Janez Janša and Janez Janša and Janez Janša.